Deccan – a tribute to rich Indian culture and one time capital of the Adil Shahi Kings (1489-1686 AD), boasts of the picturesque Bijapur. 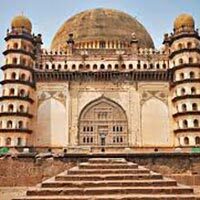 A tourist’s delight, Bijapur landscape is dotted with museums, mosques, palaces, watchtowers, fortification, strong gateways and various Moghul structures. 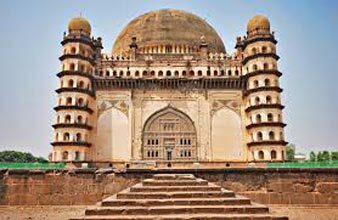 A must see attraction is the GolGumbaz symbolizing the glorious Moghul dynasty. This marvelous structure is the mausoleum of Muhammad Adil Shah. Brilliantly, the mausoleum houses without the support of pillars, second largest dome in the world. The bravura of the structure is evident in the heavy bracketed cornice placed below the parapet and the dazzling seven storied octagonal spires placed at the four corners. Tourists are particularly enamored by the mystical whispering gallery – it echoes a whisper 11 times! This captivating mausoleum of Adil Shah II is believed to have inspired Agra’s, Taj Mahal. This palatial mosque has a common platform on which two building stand supported by arches. Sprawling beautiful gardens adorn the structure from three sides. This 55 ton Canon has a lead shaped as Lions Jaw’s trying to eat an elephant. As per legend, it makes wishes come true! Badami portrays a majestic scenic beauty essayed by famous cave temples. This colorful landscape has clean blue Agastya Lake, muddy greens, and sandstone browns. The cave temples have beautifully carved bracket figures, especially the third cave has an 18 armed Nataraja, striking 81 dance poses! This World Heritage Site has a cluster of ten temples with intriguing and breathtaking architectural features. This popular tourist has temples going back to the 8th century, of Galaganatha, Kadasiddeshvara, and Jambulinga. It showcases fascinating and absorbing historical presentation of the Chalukyan architecture.